A. Wear items [earrings] are added . B. Morse can only be acquired through [Mastery Accessory Box] which is added to NPC. ※ El Dorado server can be obtained from [jewel box of blessing]. C. The entire class can be worn in common. "Rage earrings (left)" and 700 levels of wear limited "rage earrings (right)" is mounted in a dedicated slot. "Rage earrings (right)" to wear together, you can get a set season effect. 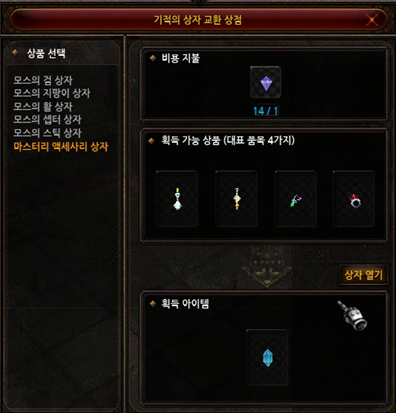 E. Earrings can be reinforced to +15 through Chaos Goblin Combination NPC's [Earring Enhancement] menu. 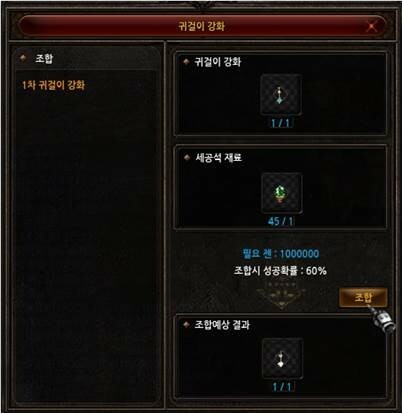 F. Earring enhancement requires a new material item [three vacancies]. 1) Morse NPC [Mastery Accessories Box] items will be added . A. You can open a box with one gem of blessing, and earring items with a certain probability. B. Accelerating Rings / Necklaces that were dropped from the field (Elven Land, Lost Tower, Atlantis, and Tar Khan) as a result of the accessory reorganization are now only available through Morse. - In El Dorado / Elysion you can earn earrings in the gem of the blessing moss box. 1) Attack power / horsepower / low main force figure and attribute defense value are held as a base, and the value increases according to the reinforcement . 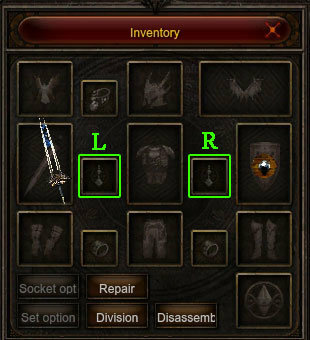 2) Earring of anger (left) and earring of anger (right) are randomly assigned one to three of five options, respectively . 1) You can activate the Earring Enhancement popup via Noria Chaos Goblin NPC. 2) Earring enhancement will consume three vacancies and zen for each strengthening order. 3) Earring will not be destroyed even if it fails to reinforce. 4) If the earring is strengthened, the [Attack Power / Power / Low Focus / Attack Defense] is increased. 1) You can create three vacancies through Noria Goblin NPC . 2) Two excellent rings have three vacancies, two excellent necklaces, three vacancies, and two excellent earrings combined into four vacancies. 3) If you combine 10 pieces of jewelry (Life, Creation, Soul, Chaos, Harmony, Guard) into each type, you will get one vacancy. - Bundles of jewels can not be combined in bulk. 4) The three vacant items are used as reinforcing materials for earrings.